But somehow the wire going to the left ear got damaged. The outer coating isn't damaged. Of course I can still listen to the podcasts with audio coming out of just the right ear-bud. I'm not listening to audio anyways. Momentarily, you tend to forget that only the right ear-bud is working. I wonder if my left ear will go deaf if I listen to audio like this. Maybe I should get a new set of ear-buds. But for the time being, I have to dig up my Sennheiser CX500s. No idea where I have kept them - hopefully they are in the laptop carry bag. Should I get a new set of ear-buds? If I can do with the CX500's, I'll wait for the next iPhone and see if it comes with a decent design. 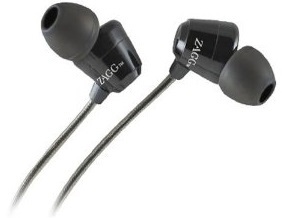 Apple has been copying stuff from others and who are we to say they that they won't copy ZAGG's design? Oh dear! The CX500 ear-buds are not working anymore! I don’t know what is wrong with them. They are simply not working. Nothing is coming out of the ear-buds. Looks like I might have to order a new pair of ear-buds soon.